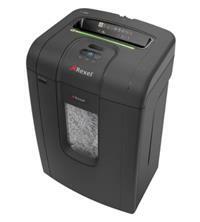 The Rexel Mercury RSX1834 Cross-Cut Shredder is ideal for small office environments with up to 10 users. It has a P-4 DIN security rating so will shred highly confidential documents into 4 x 40mm cross-cut pieces (that’s approximately 400 pieces per sheet of A4!). The shredder will take up to 18 sheets of paper at a time, more than enough for most small office requirements. The Rexel RSX1834 has a very good-sized 34 litre pull-out bin which can hold up to 310 shredded sheets. It can also be used with handy recyclable bags. A wide variety of material can be shredded including CDs/DVDs and credit cards. The shredder will also get through both staples and paper clips too, so you save time by not having to remove these prior to shredding. Features include: Jam-free technology with continuous sensing; quieter operation with a noise level of less than 65dBA; easy to use controls; and a safety auto cut out when the bin is open. Warranty on the Rexel Mercury RSX1834 Shredder is 2 years for the machine and 10 years for the cutters.